Access Information: Turn off the Cabot Trail at Cape North Village onto the Bay St. Lawrence Road. At 15.5 km (9.75 mi), at the turnoff to Meat Cove, keep straight. Continue another 1.5 km (1 mi), turning right onto the Money Point Road. The pavement ends, and the road continues 2.5 km (1.5 mi) to a parking area at the base of the hill. Introduction: Money Point received its name after a ship carrying the pay for the garrison in Quebec was lost nearby. Since then, supposedly, gold and silver coins are still occasionally found in the surrounding sand and rocks. Today only an automated light beacon warns shipping of Money Point’s hazards, but the former lighthouse still exists, moved in 1980 to the Canada Museum of Science and Technology in Ottawa. 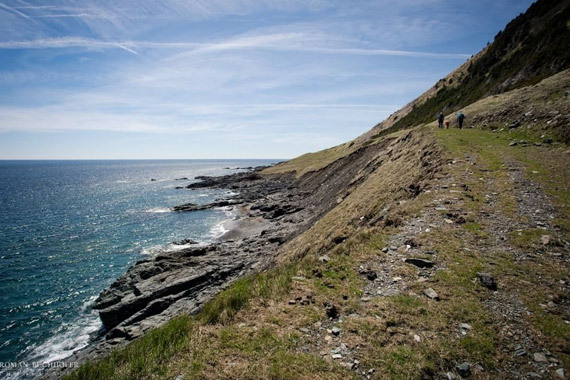 At almost the extreme northern tip of Cape Breton Island, Money Point is another hike recommended to anyone with mountain goat in his or her ancestry. With nearly 750m (2,500ft) of vertical climb, this trail requires a certain level of fitness to undertake. The hike follows the former access road to the lighthouse, but as the current beacon is solar-powered, the road is no longer maintained, and is grievously eroded. Cautionary Notes: Wildlife, steep climbs, the exposed coastline and higher elevations experience more changeable weather and higher winds. There can be unexpected showers and cool temperatures, even in summer. Hunting is permitted in season. No signage. Cell phone: No reception except on the eastern slope and a few points on the top of the plateau.